Just Romantic Suspense: What If...??? Congratulations to "Jessica H", the winner in Connie's giveaway. Thank you to all who participated! I love that question. For me—and for many of the writers I know—those two little words are the starting place for any story. They open a portal into another world and set the stage for an adventure. That’s how Angel Falls, my new romantic suspense, started. My father was born in Porto Alegre, in southern Brazil, and on a trip there, I learned about the street children. For years, swarms of orphaned and abandoned children roamed the downtown area. I was horrified and started wondering…what if your father dropped you off as a six-year-old and left you there? What would you do? How would you survive? And who would you grow up to be? Those questions became Regina, my fiercely protective, switchblade-toting orphanage director and heroine of Angel Falls. A heroine like that needed a very special hero, so I looked to our military, people I hold in the highest esteem. Former Army Ranger Books Anderson is the hero Regina needs—but certainly not one she wants. Regina needs help protecting her best friend’s baby, but Brooks never wants to protect anyone again. Ever. Not after the failure of his last mission. Then came more what-if questions. What if they were chased across Brazil? Part of my trip included a visit to Iguacu Falls—one of the largest waterfalls in the world. The falls straddle the border between Brazil and Argentina and make Niagara Falls look tiny by comparison. On the Argentine side, there are old-fashioned catwalks suspended directly above the falls. The spray soaked us to the skin as we looked down at the rushing water disappearing under our feet. We slipped and slid along the catwalks, the concrete slabs shifting with every step, and I knew this had to be the climax scene of a story. How could it not? 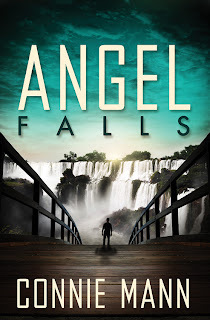 After all the questions were asked, here is a quick blurb about Angel Falls. She’ll do whatever it takes to protect her best friend’s baby. He won’t protect anyone ever again. The last time he tried, they died. But when bullets fly, Brazilian orphanage director Regina da Silva and burned-out Army Ranger Brooks Anderson dive headlong into danger to protect one defenseless child. As the danger closes in, they’ll have to trust each other to stay alive. Will that be enough to save their little angel—and themselves—from certain death? If you leave a comment about this post, you’ll have a chance to win a copy of Angel Falls (print copy, US only). Thanks for the chance to visit with you! I’d love to hear what you think of Brooks and Regina’s story. Connie Mann loves stories of suspense, adventure and second chances. She offers encouragement to busy women on her blog: www.BusyWomenBigDreams.com and is an active member of Romance Writers of America and American Christian Fiction Writers. She’s also a USCG-licensed boat captain, so when she’s not writing, she’s usually on Central Florida’s waterways with local school children or her fabulous family. Visit Connie online at: www.conniemann.com. Giveaway ends 11:59pm EST March 24th. Please supply your email in the post. You may use spaces or full text for security. (ex. jsmith at gmail dot com) If you do not wish to supply your email, or have trouble posting, please email maureen@justromanticsuspense.com with a subject title of JRS GIVEAWAY to be entered in the current giveaway. US only. I really like the sound of this book. I haven't read anything by Connie Mann before but I will definitely be giving her books a try. Ooooh, sounds like a legend read! Being foreign myself, I always love reading books set in foreign settings-- and I've yet to go to Brazil! This site rocks for introducing me to new authors. Connie, your what if's look like a thrilling read. I loved TRAPPED! - so excited to read about your latest release. Looking forward to reading ANGEL FALLS! Angel Falls now tops the TBR list; it sounds like a dynamite read. Love how you described Regina! It looks like an exciting story with a tough heroine, my favorite kind. Romantic suspense is my very favorite!! This one sounds really good and I'd love to be entered. Thanks for the chance. The book cover looks like the Devil's Fall in South America. I can never pronounce that name in Spanish. I love the book cover and the story concept. Thanks for the giveaway. This sounds like an interesting book. I am always looking for new books and authors to try. Thank you for this giveaway!